The Marussia team has decided to race just one car at the inaugural Russian Grand Prix after Jules Bianchi suffered serious brain injuries in a crash at Suzuka last weekend. The Frenchman's vehicle is shown here in Sochi. Britain's Max Chilton is the Anglo-Russian outfit's sole entry for Sunday's race. 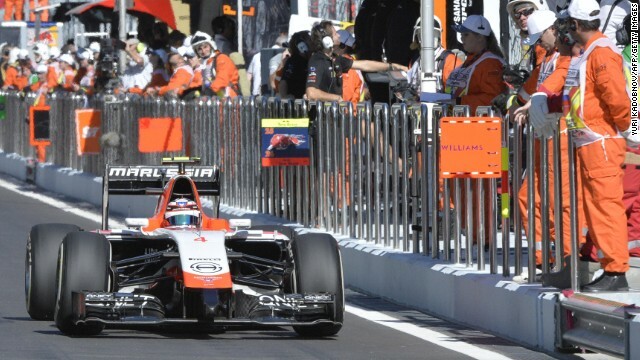 Bianchi is the only Marussia driver to have won championship points in the team's four seasons on the grid. 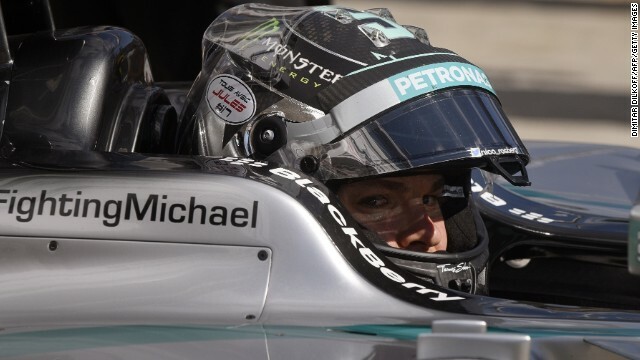 Nico Rosberg's helmet has a sticker saying "All of us with Jules" in French to support Bianchi. His Mercedes also has a message backing F1 legend Michael Schumacher, who is in long-term recovery after a skiing accident 10 months ago. Rosberg was fastest in Friday's opening practice session but the German's teammate and title rival Lewis Hamilton (pictured) was quickest in the second outing. Hamilton, the 2008 world champion, leads the standings by 10 points from Rosberg with four races remaining this season. 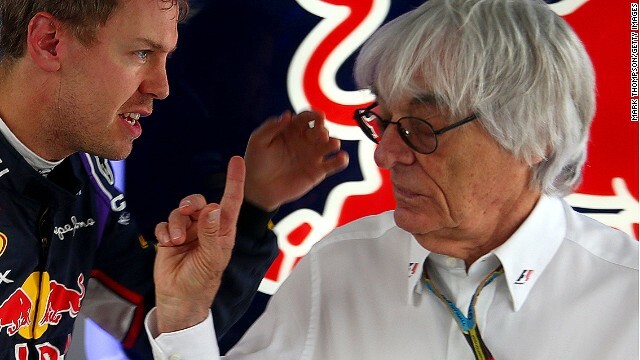 Four-time world champion Sebastian Vettel speaks with F1 supremo Bernie Ecclestone during practice. The German is leaving Red Bull at the end of this season and is expected to join Ferrari. 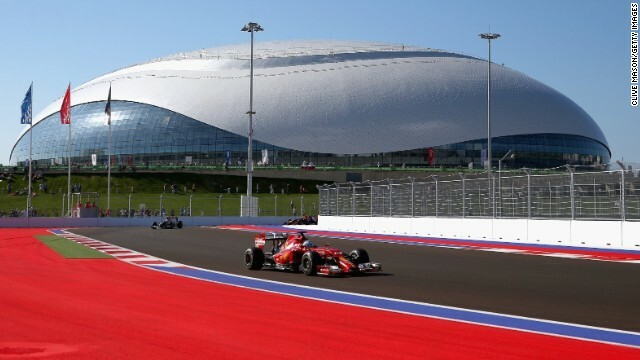 That has left doubt over the future of Ferrari's Fernando Alonso -- seen here driving in practice at the Sochi Autodrom. The Spaniard has been linked with a return to McLaren, while Red Bull has already replaced Vettel with young Russian Daniil Kvyat from sister team Toro Rosso. 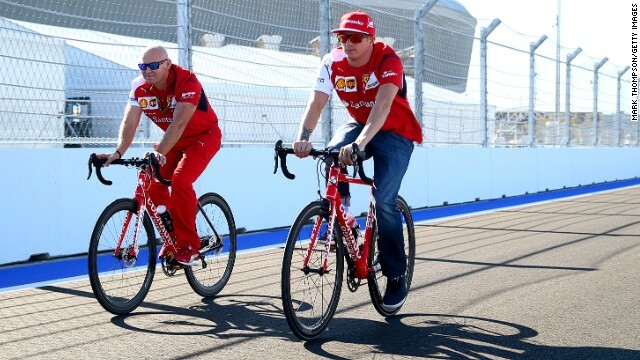 Alonso's current teammate Kimi Raikkonen (right) cycles around the new track at Sochi, which winds around the renovated resort town's Olympic park and is an unfamiliar circuit for the drivers. (CNN) -- Five days after the terrible accident suffered by Jules Bianchi, Formula One drivers got back on track Friday for two practice sessions ahead of this weekend's inaugural Russian Grand Prix. 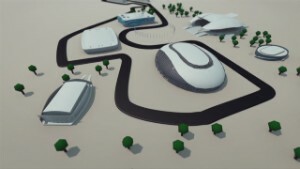 While their eyes were firmly fixed on Sochi's new circuit, their thoughts, and those of everyone involved in the sport, were very much focused on the Frenchman -- who remains in a critical but stable condition at Yokkaichi's Mie General Hospital in Japan. Bianchi's Marussia teammate Max Chilton echoed the sentiments of all the paddock ahead of Friday's opening practice session. "I don't know how to put into words how truly devastated I am by what has happened to Jules," Chilton said in a statement. "The support from the F1 family has been incredible and all we can do is be there to support Jules' family at this difficult time," the Briton added. As a mark of respect to Bianchi, Marussia will run only one car this weekend, with team kit and cars all sporting #JB17 -- a hashtag frequently used by the 25-year-old on his social media posts. Bianchi's car has also been prepared in the usual way and will sit on his side of the garage throughout the weekend, the team said. 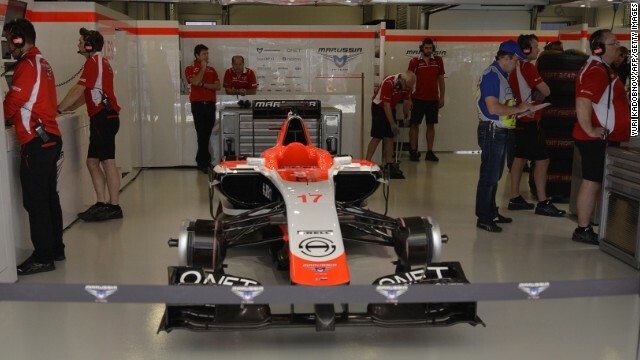 "In support of Jules and his family, the team and its cars will carry the familiar #JB17 graphic, to ensure that, although Jules is not with us in Sochi this weekend, he is, nonetheless, racing on with the Marussia F1 team," it said in a statement. All 21 drivers have put the words "Tous avec Jules #17" on their helmets to show their support for Bianchi, who was rated as a future top driver after earning Marussia's historic first championship points at Monaco earlier this season. 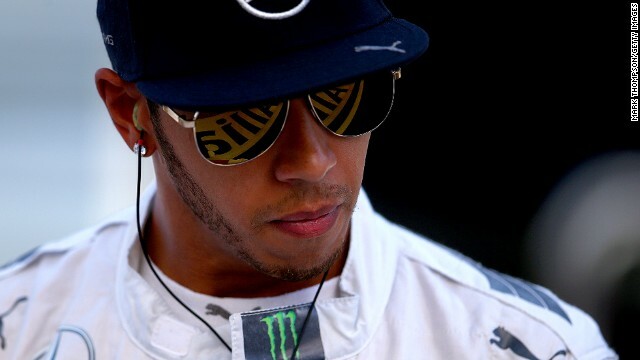 Current championship leader Lewis Hamilton tweeted: "You are with us in spirit bro and in our hearts. Prayers with you man all over the world! #forzajules #godblesshim." Bianchi was injured when he came off the track and collided with a recovery vehicle during the closing stages of last Sunday's Japanese Grand Prix at Suzuka. On Wednesday, his family revealed he had suffered a "diffuse axonal injury," a potentially devastating type of cerebral trauma that causes widespread tearing of nerve fibers across the whole of the brain. The sport's governing body, the FIA, reported on its preliminary investigation Friday, with president Jean Todt telling gathered reporters: "We have to learn from what happened -- we cannot be facing such a situation again." F1 officials at Suzuka have come under criticism for not bringing out a safety car earlier when Adrian Sutil crashed on lap 44 before Bianchi plowed into the crash scene two laps later, colliding with a recovery tractor. Race director Charlie Whiting defended his decision but said that not every driver had slowed down for the double-waved yellow flags, although he believed Bianchi did but it was a "matter of degree." Whiting added that the FIA will investigate with teams a way to automatically slow down cars when two yellow flags are being displayed. "The decision to slow down should be taken away from drivers. There will be a meeting with teams tomorrow morning to discuss that," he said. 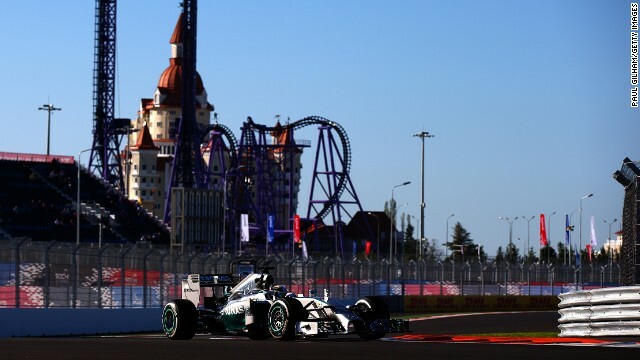 Meanwhile, Hamilton led the way in second practice Friday after his Mercedes teammate Nico Rosberg had topped the standings in the opening session. McLaren's Kevin Magnussen was second fastest, narrowly outpacing Ferrari's Fernando Alonso, with Rosberg down in fourth and Williams' Valtteri Bottas not far behind in fifth. After Hamilton's victory in Japan, he holds an 10-point lead over Rosberg in the title race with four rounds remaining, including the inaugural race at Sochi. Read more: How do crashes affect mindset of F1 drivers? Read more: Can Kvyat become Russia's first F1 champ?